Buttery and brilliant with its bold flavor, the Macadamia Nut flavored coffee will hit the spot with its roasted macadamia nut flavoring. 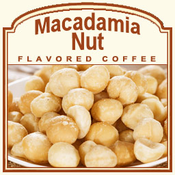 Made with 100% authentic Arabica beans, this Macadamia Nut flavored coffee has an exceptionally smooth taste that will melt in your mouth with its nutty flavor and rich wholesomeness. If you like the sweetly warm and buttery taste of macadamia nuts, this flavored coffee will offer you a warm roast of flavors certain to tantalize your taste buds. 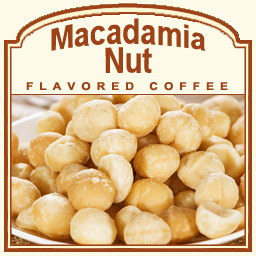 Roasted, packaged, and shipped all on the same day � the Macadamia Nut flavored coffee will be freshly roasted to perfection and each heat-sealed bag will bring you an enticing aroma. Whether you want to indulge in this flavored coffee in the morning or pair it with a macadamia nut cookie for dessert, you don't have to worry about the calories. With only 2 calories in each cup, this heavenly treat will carry your taste buds away!